1. In a small bowl, whisk together lime juice, honey, cumin, chile powder, and cayenne, if using. Set aside. 2. 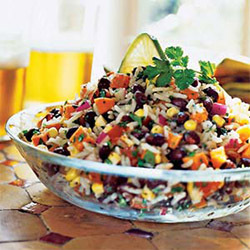 In a large bowl, stir together the beans, rice, and corn. Next, stir in the onion, red peppers, and cilantro. 3. Drizzle lime-honey-spice mixture over ingredients in the large bowl. Stir to coat evenly, and add salt and pepper to taste. 4. Add tomatoes and avocados last, folding in gently so as to not crush them. This protein-packed salad keeps in the refrigerator for 2-3 days. It’s good as a meal or as a side dish. Best if made a couple hours ahead so that flavors can blend. The lime juice keeps the avocado from turning brown.